Occurrence: Mackerel from both recreational catches and commercial landings is eaten after cooking from fresh fish. 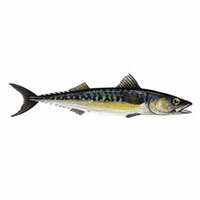 Mackerel may occur in some mixed seafood dishes. Canned mackerel may have reduced allergenicity as is found with tuna. The Atlantic mackerel (Scomber scombrus, NEWT 13676), Chub mackerel (Scomber japonicus, NEWT 13677), and blue mackerel (Scomber australasicus, NEWT 29150) are closely related species. The horse mackerel (Trachurus novaezelandiae, NEWT 271942), which has also been reported as an allergenic food, is only distantly related. Most articles mentioning allergy to mackerel describe allergy to fish in general without attributing symptoms specifically to mackerel. Hamada et al. (2003)  list the symptoms of the 5 patients who provided sera as urticaria in all 5 cases with additional symptoms of asthma for one patient and diarhoea for another. Helbling et al. (1996)  describe the symptoms of 39 patients as pruritus (27/39), hives (27/39), asthma and wheezing (21/39), angioedema (20/39), dyspepsia and cramps (7/39), vomiting (3/39), shock (3/39) and fainting (2/39). Only 4/39 patients had a history of allergic reaction following ingestion of mackerel but 20/39 had a positive SPT and 9/23 a positive RAST to mackerel. Bernhisel-Broadbent et al. (1992)  describe symptoms on challenge with other fish species as oral pruritis in 10/11 patients together with cutaneous symptoms (urticaria, angioedema, pruritis or erythema) in 6, gasterointestinal in 2, while one patients showed laryngeal symptoms and another wheeze. de Martino et al (1990)  also noted that 1/20 cod allergic children had a clinical history of reaction to mackerel although only 4/20 children reported ever eating mackerel. Helbling et al. (1996)  made an extract of Alaska pollack and of 4 crustacean species. 16 commercial extracts of fish, including mackerel, and 12 commercial extracts of inhalant allergens were also used . Bernhisel-Broadbent et al. (1992)  added 10 g. of raw or cooked fish (catfish, bass, perch, mackerel, tuna, salmon, trout, codfish and flounder) to 40 ml. phosphate buffered saline in centrifuge tubes with a glass marble. The tubes were placed in a test tube rotator overnight at 4°C. Samples were centrifuged at 1250 x g for 15 min and then at 16000 x g for 15 min. Supernatants were lyophilized. Skin tests used extracts of raw fish, probably reconsituted 1:20 (w/v). Commercial sardine extract was used (Greer laboratories, Lenoir, NC). Helbling et al. (1996)  defined a positive skin prick as producing a 3 mm diameter wheal in a patient who reacted to the positive control (1 mg/ml histamine diphosphate) and not to 50% (v/v) glycerol in PBS. Results were recorded after 15 minutes. Helbling et al. (1996)  tested 35 out of 39 study subjects with mackerel together with 18 atopic control subjects. Helbling et al. (1996)  found that 21/35 fish allergic subjects gave a positive skin test to mackerel. One atopic control subject also reacted. Bernhisel-Broadbent et al. (1992)  reported that 8/11 patients gave positive SPTs with mackerel extract. The wheal diameters of positive tests were 6-26 mm. For comparison, the least reactive was sardine with 8 positive and 4-8 mm diameters while cod extract produced 9/11 positive wheals with 4-40 mm diameters. de Martino et al (1990)  reported that only 4/20 of the cod allergic children reacted to mackerel extract and none of the cod negative children reacted. Hamada et al (2004)  used natural and recombinant parvalbumin from pacific mackerel, Scomber japonicus. Hamada et al (2003)  used purified parvalbumin from pacific or chub mackerel, Scomber japonicus, Atlantic mackerel (Scomber scombrus) and blue mackerel (Scomber australasicus). Hamada et al (2003)  used purified collagen from Japanese eel, alfonsin, mackerel, skipjack and bigeye tuna and also purified parvalbumin from bigeye tuna. Helbling et al. (1996)  made an extract of Alaska pollack, anchovy, mackerel, rainbow trout, salmon and tuna by blending 500g of raw fish in 1L of 0.01M PBS, pH 7.2, in a Waring blender for 1-3 minutes at room temperature. The mixture was extracted overnight at 4°C and centrifuged (70,000 x g). Supernatants were concentrated with an Amicon YM1 filter (molecular weight cut-off 1 kDa) and recentrifuged (180,000 x g). Commercial extracts of bass, catfish, codfish, haddock, perch, sardine, herring, snapper, sole and whitefish were dialysed against 0.1 M borate, ph 8.0, and concentrated by dialysis against Ficoll 400 (Pharmacia). Cyanogen bromide activated paper disks were loaded to 50 μg protein per disk for RAST. Hamada et al (2004)  used ELISA and ELISA inhibition. Hamada et al. (2003)  and Hamada et al (2003)  used CAP-RAST, ELISA, and ELISA inhibition. Helbling et al. (1996)  used RAST and RAST inhibition. A positive RAST was ≥3% binding of the added radioactivity. Bernhisel-Broadbent et al. (1992)  used immunoblotting. Hamada et al (2004)  used sera from 2 fish allergic patients. Hamada et al (2003)  used sera from 5 fish allergic patients. Hamada et al (2003)  used sera from 15 fish allergic patients. Helbling et al. (1996)  used sera from 23 fish allergic patients. Hamada et al (2004)  reported an IgE binding inhibition study of natural and recombinant mackerel (Scomber japanicus) parvalbumin against purified parvalbumins from Japanese eel, horse mackerel, red sea bream, skipjack, bigeye tuna and Japanese flounder. They concluded that there was significant IgE cross-reactivity between mackerel and other fish parvalbumins and that the recombinant mackerel parvalbumin could be used to diagnose fish-allergy. By ELISA, four of the five patient sera tested reacted to all the purified mackerel parvalbumins. Serum from patient 5 was found to react to collagen but not to parvalbumin. Hamada et al (2003)  also reported CAP-RAST classes against several species of fish for 15 fish allergic patients, probably including some of those of Hamada et al. (2003) . 4/15 sera were found to react with bigeye tuna collagen by ELISA and 3 of these were tested to show that collagen extracted from Japanese eel, alfonsin, mackerel, skipjack and bigeye tuna gave similar IgE binding. Helbling et al. (1996)  reported a positive RAST with mackerel for 9/23 fish-sensitive subjects, which was the third lowest response rate of the 20 fish tested. The proportion of positive responses varied from 8/11 for cod and 8/12 for haddock to 4/29 for anchovy and 5/27 for tuna. It had been suggested that some positive SPTs with commercial fish extracts were due to histamine contamination and in this study 13/18 and 5/18 atopic controls reacted to anchovy and tuna respectively. However, the correlation for mackerel between RAST and SPT results with 5.2% of radioactivity bound by sera from SPT positive subjects and 1.3% bound by sera from SPT negative subjects suggests that the SPT results were not influenced by histamine. RAST inhibition of mackerel was greatest for anchovy extract, 80% (only slightly less than mackerel extract), with salmon near 40% and tuna near 20%. Bernhisel-Broadbent et al. (1992)  separated proteins by SDS-PAGE by the method of Dreyfuss et al. (1984) . Immunoblotting detection method:Bernhisel-Broadbent et al. (1992)  transferred proteins electrophoretically onto nitrocellulose membranes in Tris-glycine buffer (pH 9.1) containing 20% (v/v) methanol. These were blocked in PBS with 0.5% porcine gelatin and 0.05% (v/v) Tween 20. The membranes were probed with 1:25 (v/v) diluted sera from fish allergic patients. Bound IgE was revealed by biotinylated goat anti-human IgE, followed by reaction with an enzyme horseradish peroxidase-avidin-D solution (Vector Laboratories, Burlingame, CA). Bernhisel-Broadbent et al. (1992)  showed that IgE from the sera of a salmon allergic patient recognised a 13 kDa allergen in extracts of several raw and cooked fish including mackerel. Sera from a flounder allergic patient did not recognise salmon extract but did bind to the 13 kDa band in mackerel. Symptoms:No oral challenges have been reported with mackerel. Hansen et al (1997)  showed that there was IgE cross-reactivity between cod, plaice, herring and mackerel in their 8 patients using skin prick, histamine release and inhibition of IgE binding. This was shown by immunoblotting to be due to parvalbumins in these species related to the parvalbumin Gad c 1 of cod. Similarly, Hamada et al. (2003)  found that IgE from 4/5 patients reacting to salmon, cod, sardine and tuna also bound to the parvalbumins from 3 species of mackerel. Hamada et al (2004)  reported cross-reaction of natural and recombinant mackerel parvalbumin against purified parvalbumins from Japanese eel, horse mackerel, red sea bream, skipjack, bigeye tuna and Japanese flounder. Bernhisel-Broadbent et al. (1992)  found that 8/11 patients gave positive SPTs to mackerel and 8 also reacted by DBPCFC to at least one fish species (mackerel was not used for challenge). The similarity of beta-parvalbumin sequences suggest that there will be cross-reactivity between all the teleost fish species (and possibly to frog). However, the cross-reactivity is not complete with individual patients reacting differently to various fish species (Sicherer et al, 2004 ; Tanaka et al, 2000 ; de Martino et al, 1990 ). Tanaka et al, 2000  reported that mackerel allergy is most closely associated with allergy to salmon and sardine. Hamada Y, Tanaka H, Sato A, Ishizaki S, Nagashima Y, Shiomi K.
Expression and evaluation of IgE-binding capacity of recombinant Pacific mackerel parvalbumin. Hamada Y, Tanaka H, Ishizaki S, Ishida M, Nagashima Y, Shiomi K.
Purification, reactivity with IgE and cDNA cloning of parvalbumin as the major allergen of mackerels. Chopin C, Lardy N, Daniel A, Fleurence J.
Shiomi K; Hayashi S; Ishikawa M; Shimakura K; Nagashima Y.
Alternatve Allergen Names:Sco j 1, Sco a 1 or Sco s 1 (not in IUIS list) from Scomber japonicus, S. australasicus and S. scombrus respectively (chub mackerel, blue mackerel and Atlantic mackerel). Process, chemical, enzymatic:Most parvalbumins quickly refold in the presence of calcium and thus allergenicity survives cooking. The purification of mackerel parvalbumins can include a heat treatment using a boiling water bath for 20 minutes without loss of IgE binding (see below). Hansen et al (1997)  showed that there was IgE cross-reactivity between cod, plaice, herring and mackerel in their 8 patients using skin prick, histamine release and inhibition of IgE binding. This was shown by immunoblotting to be due to the parvalbumins related to Gad c 1 of cod. Similarly, Hamada et al. (2003)  found that IgE from 4/5 patients reacting to salmon, cod, sardine and tuna also bound to the parvalbumins from the 3 species of mackerel. IgE from the fifth patient's sera was found to bind to collagen. Hamada et al (2004)  tested the effectiveness of inhibition of IgE binding of natural and recombinant mackerel parvalbumin against purified parvalbumins from Japanese eel, horse mackerel, red sea bream, skipjack, bigeye tuna and Japanese flounder. They concluded that there was significant cross-reactivity and that the recombinant mackerel parvalbumin could be used to diagnose fish-allergy. Parvalbumin was purified from the white muscle of three species of mackerel (Scomber japonicus, S. australasicus and S. scombrus) by gel filtration on Sephadex G-75 and reverse-phase HPLC on TSKgel ODS-120T, essentially as described for horse mackerel (Shiomi et al, 1998 ). Purified preparations from each of the three species gave a single band of about 11 kDa (Hamada et al. 2003 ). Parvalbumin was also purified from the white muscle of the more distantly related horse mackerel (Trachurus novaezelandiae). An extract was made by homogenizing white muscle with 4 volumes of 0.01 M phosphate buffer, pH 7.0. The extract was centrifuged at 18,800 x g for 20 minutes. The supernatant was heated in a boiling water bath for 20 minute and centrifuged again. After dialysis against water (Spectra/Por 6 membrane, cut-off 3500 Da) and concentration with a rotary evaporator, the supernatant was purified by gel filtration on a Sephadex G-75 column (2.5 x 90 cm) equilibrated with PBS, pH 7.0, and eluted at 30 ml/h. Allergen containing fractions were combined and applied to reverse-phase HPLC on a TSKgel ODS-120T colun (0.46 x 25 cm). Fractions were eluted at 1 ml/h. with a gradient of acetonitrile in 0.1% trifluoroacetic acid. Parvalbumin was eluted as a single peak after 6 small peaks. The yield was 31 mg from 78 g of horse mackerel muscle and this gave a single band corresponding to a molecular weight of 10,500 by SDS-PAGE, regardless of the presence or absence of a reducing agent (Shiomi et al, 1998 ). Hamada et al (2004)  expressed recombinant pacific mackerel, Scomber japonicus, as a 38 kDa GST-fusion protein in E. coli using the pGEX-6p-3 system. This was specifically bound on a glutathione-Sepharose 4B column and cleaved with PreScission Protease on the column. The parvalbumin was eluted from the column to give approximately 24 mg/l of parvalbumin giving a single band at 12 kDa on SDS-PAGE. The sequence P59747 from mackerel is most similar to Q90YK7 from Alaska pollack with 89/108 residues identical. Thus it is a member of the group of beta-parvalbumin sequences including Q90YK7 (Alaska pollack), Q8UUS3 and Q8UUS2 (carp), Q91482 (salmon) and Q90YK9 (cod) which are more than 70% identical in sequence. These sequences are 65-67% identical in sequence with members of a second group including Q90YK8 (Alaska pollack), Q91483 (salmon) and Q90YL0 (cod). However, Hamada et al. (2003)  note that only one parvalbumin is present in mackerel at more than trace concentration. Hamada et al (2004)  purified a recombinant parvalbumin with an additional N-terminal sequence Gly-Pro-Leu-Gly-Ser, an unblocked N-terminus and no glycosylation. They argue that its similar IgE binding properties show that the N-terminus and glycosylation are not involved in IgE binding. The 13 kDa allergen identified by Bernhisel-Broadbent et al. (1992)  (see immunoblotting) almost certainly corresponds to the mackerel parvalbumin with the 11-13 kDa range of observed molecular mass being due to different SDS-PAGE systems.